The International Socialist Organization is based in the United States and identifies with the politics of "International Socialism," which follows the Trotskyism philosophy. It publishes the weekly newspaper Socialist Worker and the bimonthly magazine the International Socialist Review. It also hosts the "Socialism" conference each summer. Socialist Worker 1977-2019 was the newspaper/website of the International Socialist Organization. Workers' Power: Although workers create society's wealth, they have no control over its production and distribution. A socialist society can only be built when workers collectively seize control of that wealth and democratically plan its production and distrubtion according to human needs instead of profit. The working class, both blue-collar and white-collar, is the vast majority of society and is the key to the fight for socialism. Only mass struggles of the workers themselves can destroy the capitalist system of oppression and exploitation. We support trade unions as essential to the fight for workers' economic and political rights. To make the unions fight for workers' interests, rank-and-file workers must organize themselves independent of the union officials. Revolution Not Reform: Reforms within the capitalist system cannot put an end to oppression and exploitation. Capitalism must be overthrown. The structures of the present government--the Congress, the army, the police and the judiciary--cannot be taken over and used by the working class. They grew up under capitalism and are designed to protect the ruling calss against workers. We do not support candidates of capitalist parties like the Democrats or Republicans. The working class needs an entirely different kind of state--a workers' state based on councils of workers' delegates and a workers' militia. Internationalism: The struggle for socialism is part of a worldwide struggle. We campaign for solidarity with workers in other countries. We oppose everything that turns the workers of one country against those of another country. We oppose imperialism and support all genuine national liberation movements. We oppose all immigration controls and protectionist measures. The experience of Russia demonstrates that a socialist revolution cannot survive in one country. China and Cuba, like the former Soviet Union and Eastern Bloc, have nothing to do with socialism. They are state capitalist regimes which oppress and exploit workers. We support the struggles of workers in these countries against the bureaucratic ruling class. Full Equality and Liberation: Capitalism divides the working lcass, based on sexual, racial and national distinctions. The specially oppressed groups within the working class suffer the most under capitalism. We oppose racism in all its forms. We support the right to armed self-defense in the face of racist attacks. Black liberation, women's liberation and lesbian and gay liberation are essential to socialist revolution and impossible without it. We fight for real social, economic and political equality for women and for an end to discrimination against lesbians and gays. We support the struggles of the oppressed for their own liberation. The Revolutionary Party: To achieve socialism, the most militant workers must be organized into a revolutionary socialist party to provide political leadership and organization. The activities of the ISO are directed at taking the initial steps to building up such a party. As at September 14, 2001, the following were affiliated with the ISO. These affiliations are evidenced by their contributions to the Sept. 14, 2011 issue of Socialist Worker, the newspaper of the organization, or by their involvement with the ISO, cited in the newspaper. Paul D'Amato - ISO, column, "The Meaning of Marxism"
Jon Van Camp - Washington D.C.
Allison White - Washington D.C.
Kenneth Tompkins - Washington D.C.
Donny Schraffenberger - Teamsters Local 705, Teamsters Washington, D.C.
Walden Bello - Sept. 28th panel, a Philippino communist who had taught at universities in the Philippines and Thailand, a planner of the 1992 World Bank protests. 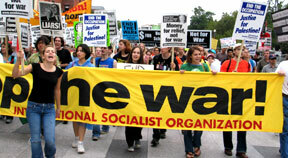 Nathan Lord Converse - " a recently graduated GW student involved in the coalition"
The Committee to Stop FBI Repression lists International Socialist Organization as one of the organizations that has issued a statement of solidarity in support of the activists raided in the September 24, 2010 FBI Raids. This page was last modified on 2 April 2019, at 22:33.